A few storms expected by Friday afternoon. 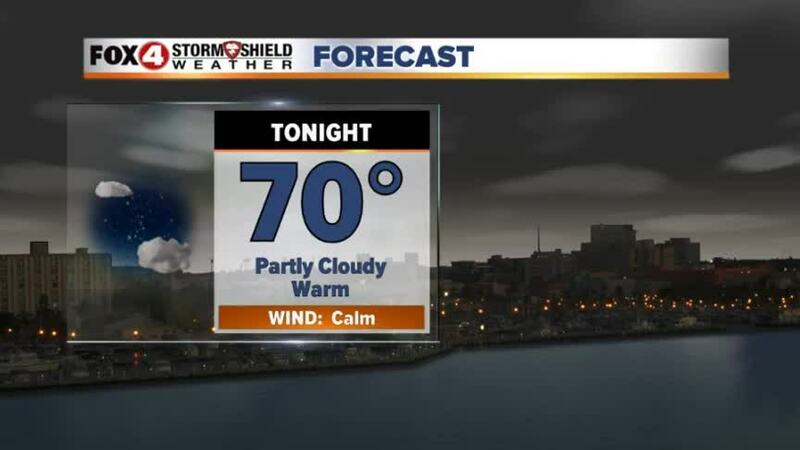 The forecast through tonight will be dry, warmer and more humid. Overnight lows will drop to around 70. Highs on Friday will reach the mid 80s under a mix of sun and clouds, it will be breezy as a cold front approaches the area byt afternoon with a chance for scattered storms. Some of the storms may contain strong gusty winds. The cold front will push south of the area and dissipate by this weekend with clouds and sunshine both Saturday and Sunday and highs in the mid to upper 80s. Overnight lows will remain in the mid to upper 60s. Next week will see warmer temps as high pressure aloft strengthens over the area. Highs will reach the upper 80s to near 90 from Monday through Thursday with lows in the upper 60s to near 70. A few afternoon showers will be possible from Tuesday through Thursday. If you don't already have our Fox 4 mobile app, you can download it here .